Hofstra Law, situated on the 240-acre Hofstra University main campus, provides a rich and vibrant community for students studying the law. The Hofstra campus is a member in good standing of the American Public Gardens Association and one of only 430 arboreta in the United States. Students can enjoy many campus amenities, such as a sports arena, walking trails, museums and much more. A walk around campus will tell you a lot about what Hofstra has to offer you, but until you can get here, join our Pride Guides, as they show you the sights. 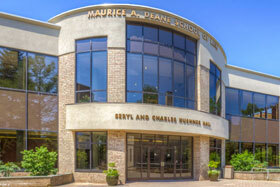 Prospective students who are interested in visiting the Maurice A. Deane School of Law at Hofstra University are encouraged to take a law student-led guided tour or a self-guided tour. Tours are offered daily, Monday through Friday. Guided tour times vary based on tour guide availability. For more information, contact the Office of Enrollment Management. Take the opportunity to become familiar with our campus by registering for a student-led guided tour. Hofstra University is located on Long Island in Hempstead, New York, about 25 miles east of New York City, less than an hour away by train or automobile.